IPPs comprise the largest share in the top 70 portfolios, owning more than half of the total capacity. In fact, do IPPs not only count for the highest capacity but also the highest number of portfolios with 7 of the top 10 portfolios being IPPs. Utilities represent the second biggest segment both in terms of megawatt capacity and the number of portfolios, followed by investors and yieldcos. 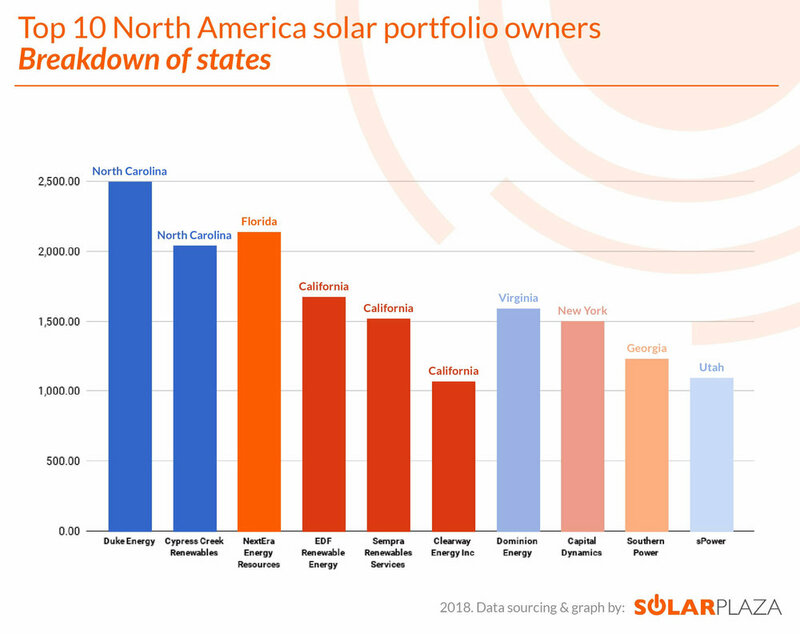 Additionally, isolating the top 10 portfolios by their place of origin, demonstrates the dominance of two states of California and North Carolina (figure 3). Although it would not be entirely implausible to assume a correlation between the location of asset owners and their portfolios, some portfolios do indeed transcend state borders. However, the companies do not always disclose their complete asset data on a state-by-state basis. Therefore, figure 2 showcases portfolio capacities with relation to the location of the portfolio owners. As shown on the heatmap, California-based companies cumulatively form the highest capacity in the top 10 portfolios and this trend remains valid for the overall top 70. The other major states, home to the portfolio owners with the largest capacity, include Florida, New York, Georgia and New Jersey. Despite what the heading suggests, New York has only one contender in the top 10, namely Capital Dynamics. With over 2 GW of solar PV capacity, a unique player sitting at the top three is the Cypress Creek Renewables. Born only three years ago, this California-based IPP has built an empire of projects with a pipeline worth 500 MW. Dominion has been working towards realizing its plan to expand its RE fleet by 3,000 MW by the beginning of 2022. The Virginian utility is currently half way through its ambitious goal, occupying the 5th largest solar portfolio in North America. In January 2018, Dominion invested $1 billion in solar projects in Virginia and North Carolina. One portfolio that most likely will not stay on the top 10 by the end of 2018 is Sempra’s as the company, as part of a portfolio-optimization push, has agreed to sell its non-utility solar generation assets for $1.54 billion.The sale is expected to fully close before the end of 2018. A new player entering the space and already part of the top 10 North American solar portfolios is Clearway Energy. The company was formed as a result of the sale of NRG Yield and commenced operations in the August of 2018. To learn more about managing, operating and maintaining North American solar assets, join the 6th edition of Solar Asset Management North America; a pre-eminent conference dedicated to optimization of the operational phase of solar assets, coming back to the high-powered and ambitious city of San Francisco on March 26 & 27. The Solar Asset Management conferences create a unique convergence of opportunities to network, learn and share knowledge, representing industry views across the entire asset management and O&M spectrum.